...and a short while later, Everygirl Kathryn Elise of Chic-ography Instagrammed the following photo saying, "inspired by @theeverygirl_ feature today"
Similarly, the food features are always a hit, and it's so fun to see people tweeting photos of our recipes from the 10 Meals for Less than $50. 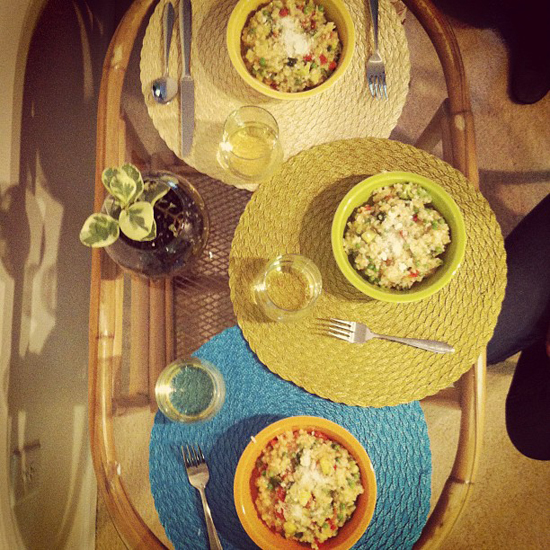 I particularly loved the styling of this risotto primavera by Katie Williamsen. I definitely didn't mean to complain at all with yesterday's post. It's wonderful to know the site is doing exactly what we had hoped. Encouraging women to make chic style decisions without overspending, to try something new (cooking! ), or to go out and find their passion and dream job. 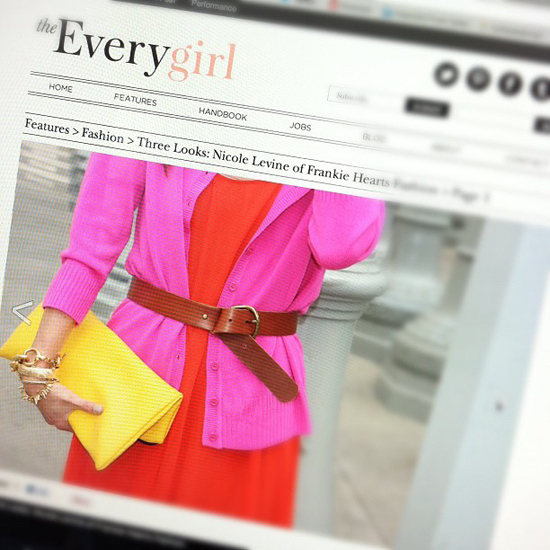 Are you reading The Everygirl? What's your favorite part of the site? And please be honest - is there anything you see that can be improved? Or that we haven't offered yet but you'd love to see or need help with in your own life? I never read online magazines, but the 10 meals under $50 lured me in. I made the chicken lettuce wraps and omg they were amazing! Like restaurant quality. Turkey meatballs are next on my list. And the place settings feature was great too. I actually really enjoy the Everygirl. Good work! I dont believe I have left a comment before on your blog but I am a daily visitor! Everygirl is chock full of eye candy and inspiration..Keep it up ladies! 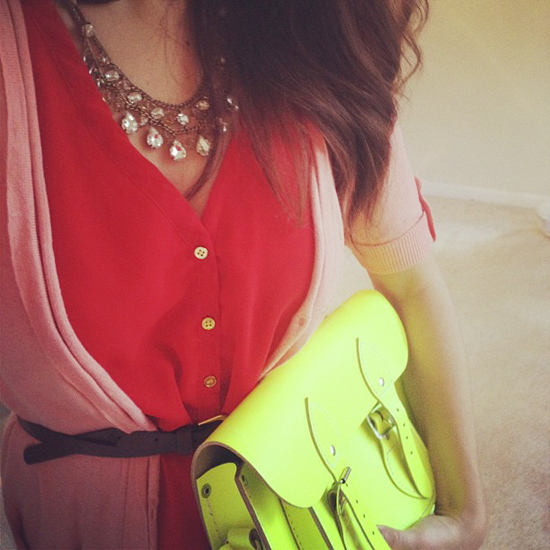 Everygirl has become a daily essential for me - whether gaining outfit, meal or career inspiration. We are SO fortunate you put your blood, sweat and tears into such an amazing resource for us. I absolutely love the Everygirl! It seriously inspires me for what my life could look like, even with just a few small changes. Being a girl who's going through transitions from college to "real life" (I know I sound so young and silly saying that) it's my perfect daily guide to keeping me sane and knowing that I can do this! Whatever that ends up being! I really appreciate everything you and Danielle have done to make this site amazing. You've gone over and beyond the call of duty. You have so much to be proud of! I just discovered The Everygirl about a week ago and it has already made it to the top of my daily reads! I just started my own design business after a couple of bland years after graduation and so finding the Everygirl was a dream come true. The Career & Finance features are incredibly helpful and inspire me to keep going even when it gets tough. Keep up the good work - you and Danielle are inspirations to young woman everywhere! The Everygirl stole my heart before it even launched. After you and Danielle announced what it was you had been working on, I called my mom to tell her about it and as I was trying to explain it to her I said, "Its for girls who...well I mean its for girls that...it's for girls like me!" Honestly, checking The Everygirl every morning makes me more excited to get out of bed. Between a new EG feature and a cup of coffee, I begin the day feeling like anything is possible. way to go Alaina, you are one inspiring lady! The career features are great because I'm graduating college in may w/ a degree in communication studies & they give me hope that I won't end up as a miserable sales person. I don't know what I want to do yet but reading about successful creative women keeps me inspired to continue blogging. I'd love to see more job postings. My dad is the best and everything but I don't want to move back home! 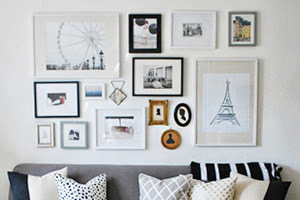 I love The Everygirl and find so many inspiring things on it daily! I have made two different recipes and look forward to trying more! Also, your guys financial tips are really helpful too! What I appreciate most about Everygirl is how approachable it is. My pet peeve is magazines/websites that feature $80 t-shirts and $400 pants. Of course you can look fabulous and have an amazing place if price is no object. Keep up the good work- especially the affordable meals/clothes/decor!!!! I love the profiles of strong, career driven women! It's inspiring to hear their stories. The quote "Success is not easy - and is certainly not for the lazy" really keeps me going. I've loved following the start of The Everygirl! I love the food features because cooking everyday for my beau and I can get rough sometimes. He has to eat a low-carb diet because he's hypoglycemic and I'm a bread/pasta addict! 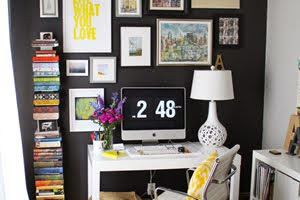 Plus, today is my two year blogoversary and I hope to someday be as awesome as The Everygirl! I just love everything about the everygirl! wouldn't change a thing! and love that outfit inspiration as well..